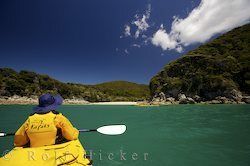 The ultimate sea kayaking experience in New Zealand is paddling the splendid yellow sand coast of the pristine Abel Tasman National Park. 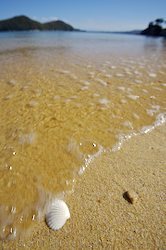 The yellow sands of Abel Tasman National Park welcomed the park's namesake some 365 years ago, but the Dutch explorer Abel Janzoon Tasman did little more in the area than lend his name to the national park that came 300 years later. Today it is world-renowned as a sea-kayaking haven, and with good reason. Turquoise water washes the yellow sand beaches, and each sheltered cove an ideal place to learn the basics. Basics mastered, the park's many estuaries and stretches of granite coastline offer worlds to discover from the seat of your boat. For a beginner, kayaking in New Zealand's Abel Tasman National Park is less about learning the finer points of honing your stroke, and more about discovering the park from a whole new perspective. Sea Kayaking is unlike any other boating adventure. A kayak doesn't ride on top of the water, but in the water, propelled only by the passenger's own strength. For a first-time paddler, it's an exhilarating ride. For seasoned experts, it remains a thrill. And in Abel Tasman, it's a year-round pursuit. Abel Tasman is one of New Zealand's 14 national parks. It lies at the Northernmost tip of South Island, near Motueka and Marahua. 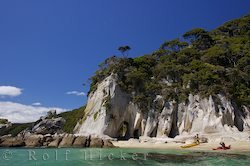 To sea kayak along the coastal waters of Abel Tasman is to live many kayakers' dream. What makes Abel Tasman such a pleasant paddle all through the year? The answer is more a sum of all parts: The sheltered bays are seldom ruffled by extreme wind. 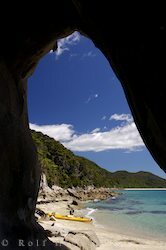 The coast is textured with caves, coves and estuaries, and dotted with islands to nose around. And while you're bound to get wet, the sun shines almost constantly on the blue waters of New Zealand's smallest national park, (Abel Tasman gets just 35 rain days in an average year). 91 kilometers (57 miles) of coastline are yours to discover. The water is so clear you can see the shadow of your kayak glide across the rippled sand bottom. 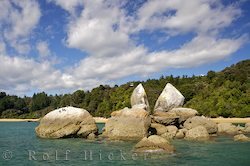 Abel Tasman being a choice destination (its sparkling waters and magnificent sights come highly touted), it can get crowded on the water, especially during the warmer months of November through April. Christmas time is their peak season, but advanced bookings for campsites or any guided excursion is recommended. Luckily, you can paddle year-round in Abel Tasman. The average maximum temperature during winter is 13 degrees Celsius, (55 degrees Fahrenheit), so wetsuits are recommended for the colder months of the year. A third of New Zealand's land is devoted to national parks, ecological reserves, or other parkland. Much less of their 15 000 kilometers (9 300 miles) enjoys the same protection. In Abel Tasman, you find the best of both worlds: The Tonga Island Marine Reserve stretches along on part of the park's coast, and harbors fish and marine mammals, reefs and seabirds. Tonga Island itself is off-limits to picnickers, as no one is allowed to land on its shore. But from the seat of your boat, you can watch the New Zealand Fur Seal colony, and maybe be lucky enough to spy a few young pups. The New Zealand Fur Seals that call Abel Tasman home are used to the colorful hulls of sea kayaks. Some curious creatures may come so close as to play around your boat. Keep an eye out for sea lions, dolphins, and even the occasional Orca whale. Bird-watchers won't be disappointed. Gannets, penguins, tuis, bellbirds, and a variety of gulls, terns, herons and shags flock to the park all through the year. 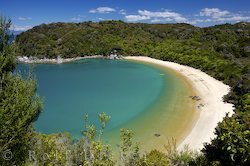 If you're planning a trip to take in the coastal splendor of Abel Tasman National Park, be sure to book campsites and outings well in advance. Its well-earned reputation brings adventure-seekers throughout the year, and some tour companies operate year-round. If you're looking for a day's excursion, or a multi-day adventure, Abel Tasman Kayaks or their sister company Abel Tasman Wilson's Experiences are award-winning tour operators who cater to beginners and guests of all levels. Like most companies operating in the park, they combine hiking and kayaking on many of their trips, and their guides whip up full-course beachside lunches using local green-lipped mussels and an assortment of other delightful kiwi fare. Their water taxi will take you from Marahau to your kayaking set-in point. 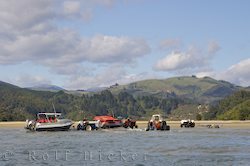 At low tide, the water taxi does its best imitation of an amphibious vehicle: From the office guests are towed out (while seated in the water taxi) to beyond the sandbar by a tractor, and launched directly from the trailer into Tasman Bay. Often the journey to the put-in location includes a diversion to some interesting coastal geology such as Split Apple Rock - a small island with a rock which looks just as it's name suggests. Southern Exposure has been running tours and renting gear in the park for 10 years. They limit guided tours to just eight people, so you can count on an intimate experience.